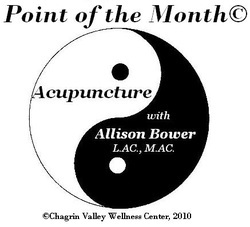 Allison Bower, L.AC., M.AC., will demonstrate and explain various Acupuncture points in CVWC's monthly video series, "Point of the Month©." These videos will answer some common questions, such as, "Does it hurt?" "What can Acupuncture do for me?" To schedule an appointment and/or ask Allison a question call 216.364.0152 or email - appointments@chagrinvalleywellness.com. This point is a lung official that is all about purity and self worth. With this point we will be able to move the phlem in the lung, move old grief and move longing out. This will make presence to our life fully and we will let go what is not valuable anymore. The colon is paired with the lungs in the metal element. This is source point and entry point for the colon and the exit point from the lungs. "Joining of the Valleys" brings together the lungs' receiving ability into the colon which is about letting go. This is the supreme point for letting go of all that does not serve us in life on every level. September 2011 - Point of the Month© - "Great Capital"
This is a Fire point in the Earth element; so it is the fire within the earth. Earth and spleen rule the muscles, so if there is too much fire in the muscles, that shows as Fibromyalgia. This point is found on the palm of the hand between the pinky and ring finger. It serves as a transmitting point for all the virtues of the pericardium. It resurrects a heart that has been unfulfilled or weary from loving. It also quiets mania. "Rushing into the Middle" on the Pericardium Meridian is about bringing energy of Wood, the vision and clarity, to the heart. This point helps with relationships, relating to yourself and to your heart and bringing the energy if the Wood, or Springtime's, vision and clarity into the heart and relationships. "Middle Eyelet" on the Triple Heater Meridian empowers the virtue of the vision and clarity regarding the horizons in your life. The Fire is about Summertime and maturity. This point helps us to live in harmony with our environment. * There can be a stagnation of Qi (pronounced 'chi'), heat, dampness or wind. * Good for dispelling annoyance over details because it empowers the vision of the bigger picture; since the liver is about making and plan and enforcing that plan. "Great Esteem" & " Foot Above Tears"
a wood point on a wood meridian is called a Horary Point. It empowers vision of those aspects of self that root us into the ground. Treats migraines, impotence, self esteem. Think of feeding the roots of a plant so the plant itself can grow. also known as Foot Near Tears and a Horary Point. It empowers the acknowledgement and expression of frustration and anger so tears can be released and stagnant emotions resolved. Finds our way creatively around obstacles, thus dispelling frustration. February 2011's Point of the Month© - "Water Point in Wood"
January 2011's Point of the Month© - Auricular "Sympathetic & Shen Men"
December 2010's Point of the Month© - Winter Treatment "Bladder & Kidneys"